In December 1963, a department of the People's Liberation Army started work on a book of quotations by the Communist Party leader, Mao Zedong. It was to be used in drill sessions with recruits; short excerpts without context or analysis designed to be memorized and chanted. This was a difficult time for Mao. His Great Leap Forward, an attempt to propel a peasant society into the Industrial Age in a few years, had failed, resulting in mass famine. Mao had been criticized by his fellow leaders. By May 1964, under the guidance of Defence Minister, Lin Biao, the first edition appeared with the title Quotations from Chairman Mao Tse-Tung. Over the next decade the book was to be printed in more than a billion official copies and countless other versions, becoming a symbol of revolution in China and youthful rebellion around the world. But the guardians of Communist Party orthodoxy tried to strangle it at birth. The book's format was deemed vacuous and a debasement of the Chairman's thought. They did not want it circulated outside the army and it was to be kept secret from foreigners. With the reluctant publishers purged, and the start of the Cultural Revolution -- Mao's unleashing of his young Red Guards to crush his rivals -- China's entire publishing industry was turned over to producing the chairman's words. By 1966, it had found its iconic format: red vinyl cover to withstand the rigors of army life and compact size to fit in a uniform pocket. Once every citizen of the People's Republic had a copy, translations were shipped around the world. Lin Biao's preface to the first English edition promised that Mao's thought would become 'a spiritual atom bomb of infinite power'. In Western Europe, his toadying words seemed to ring true. Young people chafing under bourgeois rule and disappointed with Soviet-style bureaucratic communism rushed into the streets in 1968, Little Red Book in hand or pocket. In Berlin, students at the Free University put up banners proclaiming: 'All professors are paper tigers.' It seemed that East and West were at one. 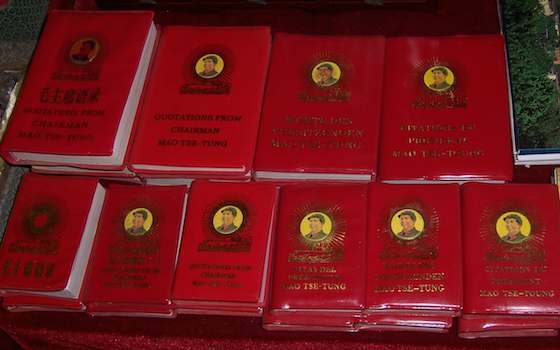 But as Daniel Leese argues in Mao's Little Red Book: a Global History, the appearance was deceptive. While in the West the book was an icon of restive youth eager for social revolution, in China it had become 'a symbol of imposed worship to discipline the masses, conducted under the auspices of the People's Liberation Army'. After Mao's death in 1976, printing stopped and millions of copies were destroyed. The sacred text of the 1960s which had been used to justify unspeakable acts of cruelty in the years of the Cultural Revolution became an embarrassment. Young people all over the world, China included, are more likely these days to carry a smartphone and get their words of wisdom from social media, some of it in nuggets as concise as Mao's quotations. The Chairman was right about the attention span of the masses.